Etsy shop need a makeover? Don't let bad photos scare customers away. Learn how to create irresistible drinkware product images that help you sell in this FREE 5 day email course. One way to make an image look more dramatic is to make everything black and white, except for the focal point. In this video and post, that is what I am going to show you. Enjoy! Would you rather read instead of watch the video? Scroll on down to read the blog post! You will begin by going into your layers palette and duplicating the background layer. You do this by dragging it down onto the little page icon at the bottom. For teaching purposes, we'll call this Layer one. Next, you will need to desaturate Layer one. That means you're going to turn it to black and white. To do this, click Image > Adjustments > Hue Saturation, and then drag the saturation slider all the way to the left. Now the top layer (Layer one) is black and white, and the bottom layer is color. 3) Create a Mask on Layer One and Cut Out the Focal Point. The next step is to make a mask on Layer one by clicking on the icon down at the bottom of the layers palette that looks like a square with a circle on it. When you hover over it, it will say “Add layer mask”. When you click on it, a little white box will appear on that layer. Basically what is going to happen is you are going to cut a hole through this white box to reveal the colored layer underneath. Select your brush tool and make sure that black is selected as the foreground color. Next, make sure that the white box on the layers palette is still selected, and paint over the focal point on the image that you want to be colored. If you need to change the size of your brush, you can use the brackets on your keyboard. So you can see this looks a little bit more dramatic and moodier than before. Hope you enjoyed that quick tip! If you’re looking for a quick way to add some branding to an image, then dropping your logo into it is a great option. Some people refer to this as “watermarking” your image, though actual watermarking typically has text or a logo quite large, and right across the middle of your design…. It’s pretty intrusive and the idea is that people can’t steal your design if it’s there. But I recommend you go with a subtler approach on these and just add your logo in the corner or off to the side, if you want to add it at all. Normally, you would just open a logo image from a saved file and place it into the image that you are trying to brand. But there's another faster way to save your logo for watermarking across lots of images, right inside Photoshop. The most efficient way to do this is to save it as a brush preset. In this post and video, I’m going to show you how! Prefer to read the written instructions? No prob! Just scroll on past the video! 1) Open your logo and change it to black. Start by opening your logo in Photoshop. You will want to change it to black. To do this, click Image > Adjustments > Threshold, then just drag the slider until it’s black. 2) Save your new brush. Next, click Edit > Define Brush Preset. It will prompt you to give the new brush a name. Give it an appropriate name, and click OK.
3) Stamp your image with the logo brush. Go back to your photo. Open up the layers palette and create a new layer. This is where your watermark is going to go. Move your brush to the spot that you would like for your logo to be, make sure that it is sized correctly. The brush will use the foreground color, so make sure that your foreground color is the color that you would like. Once you have it the size and color that you’d like, just click! 4) If desired, change the opacity on your logo. If you want to make the image a little more see-through, or subtle, then just slide the opacity adjustment on the layer so it’s more transparent. There you have it! Easy peasy! I hope you enjoyed this tutorial, and please reach out if you have any questions. If you're viewing this video, then you've probably just purchased a file from my shop and you want to understand how to put your design into it. Well, today I’m going to show you how to do exactly that! Prefer to read the instructions? No prob! Just scroll down for the transcript. 1) Make sure that your layers palette is showing. Once you have opened the file in Photoshop, you will need to make sure that your layers palette is showing. To do this, click “Window”, and then make sure that there is a check mark beside “Layers”. 2) Edit the smart object. You should see your mockup on the first layer. Underneath that layer, there is a layer that says “Double Click Me”. So that's what you do! You go to the square thumbnail, double click that and that will open a .PSB tab in your Photoshop window. This is where you could add a different design, hide the design, or delete the design. Since there's an Asterisk up there in the .PSB tab, you know you have not saved your new design. You must save it for this to work. For a quick way to save, just hit command+s, or you could just go up to File > Save. Then you can go back to your main file and you can see your new design! If you have any questions, you can reach me through my Etsy, Creative Market, or SoFontsy shops. Or you can always contact me through this website. Also, let me know of any other sorts of mockups you may need! I am always taking suggestions on what kinds of mockups to create. Thanks a lot! I hope you enjoy the file! What are you using to create your images for your online shop right now? Canva? PicMonkey? Silhouette? The built-in image editor for iPhone? You've heard of Photoshop. You know it’s out there and can help you make your images look really good, but you aren’t using it yet. And I think I know why. Many people who haven't dug into Photoshop mockups yet are held back by certain beliefs. Certain MYTHS. Myth #1: You have to be a tech genius to learn how to use Photoshop. Compared to Canva and PicMonkey, it can seem like getting started in Photoshop is tough. But I promise that I can show you how! You probably think you’re saving money by using programs like Canva and PicMonkey, but you actually aren’t. It’s really costing you more money to use those programs for your mockups because your images won’t look as professional - this loses you sales. And it takes LONGER to make every mockup in these programs than it does in Photoshop. Photoshop has a feature that allows you to add your design to multiple mockups at the same time and export them automatically in seconds with only a few mouse clicks! With a properly prepped Photoshop Mockup file you can make a ton of different variations of your design in minutes. Like this! You couldn’t make all these different color variations of skinny acrylic tumblers using a simple “lay your design on top of photo” mockup in PicMonkey or Canva. In Canva and PicMonkey, you have to go through a laborious process to mock up each design onto each separate mockup template photo over and over and over. If the design needs to be enlarged, rotated, faded out, placed exactly right, and perspective changed so it looks natural in the scene, you have to do all of those things manually with every single mockup you create. In Photoshop, all those tweaks are built into a special layer so your only task is to hit “paste” and save and export and you’re DONE! Don’t let these pretty pictures intimidate you. You (yes YOU!) can learn how to use mockups just like these once you learn how to use the program. Worried about the time it will take you to learn Photoshop? Don’t be. It doesn’t take as long as you’d think and the minor time investment you do make will serve you for years to come. Once you know how to use Photoshop you’ll be able to make any picture into a mockup at a moment’s notice with no additional money outlay. When I was first learning how to design, I’d take classes on software like Photoshop or Illustrator and the first few lessons were always DEAD boring. They’d go through every single menu and hidden function in the program, and make you do useless, long-winded exercises. All this did was make me abandon-ship by lesson 3. That’s not my style. Chances are, you only need to learn a few functions to get a TON of reward out of Photoshop. "I knew how to spell Photoshop and that was it. I was very frustrated since I could not put together the virtual product photos I needed to create for my online business." Sound familiar? I teach total beginners how to use Photoshop every day, so if this rings true then you know you can do it too. I like to use real-world problems as lessons, and just cover the basic simple tools and commands you need to solve those problems fast. I’m not going to ask you to trace a photo of an Egyptian sarcophagus—that’s probably not helpful for your Etsy shop. Instead, I’ll show you useful stuff in as few steps as possible. You can do this! I believe in you, and I’m here to help. Myth #2: Photoshop is too expensive. You can get Photoshop + Lightroom for $10 a month! (affiliate link) That’s cheaper than most subscription plans, and significantly cheaper than the hundreds of dollars it used to be. Heck, even the premium Canva is $10 a month! The real truth is Photoshop pays for itself in no time. How much do you spend on stock photos and custom mockup templates per month already? You can buy 2 bundles and a couple loose mockups from me for the same price as a YEAR of Photoshop. And with Photoshop mockup skills you can make UNLIMITED mockups and any other graphic your business needs. "Hiring people from Fiverr, looking things up, and experimenting, cost more in time and frustration than one would ever pay for your course. Your course was the best use of my time and time is money. And the Adobe Photoshop subscription is such a necessity, I don't even think about its cost." "I allocated an initial investment to start my site. I knew I had to invest in software to make the images, and I needed to learn how to use that software, so the cost of your course and photoshop pays off! Now instead of trying to make a decent image of a product and taking around 3-4 hours, I can make all the images for all the variations for a product in around 20-30 minutes, especially helpful for products like mine where there are more than 30 different combinations." Plus, this student explains how she's able to maintain sales of $1000 monthly thanks to Photoshop mockups. Wouldn't you like this to be you?! "The ability to use mockups to create images in detail as to how a final product will look depending on the options selected, has been an integral factor in increasing sales and maintaining sales of at least 1000 monthly on my online shop website." Myth #3: Photoshop is only for designers. Not true! Photoshop is a workhorse that is useful for any business that needs graphics. And in my experience, every business needs graphics And you've seen from the testimonials above, that you don't need any experience to get started. The true power of Photoshop for online stores is its ability to automatically export dozens of images in just a few minutes (sometimes seconds). You can sit down and power out a bunch of design ideas for an hour, click a couple buttons and sit back as they all save out to a folder for you for every single product you sell. Like my Mockup Scene Creator product. I am able to add designs to products for a bunch of different styled mockup scenes by pasting them into a smart object. Then that design puts itself into ALL the photos in my Photoshop file and I can export all my product listing mockups at once, in seconds. There's this "golden" 100 products that everyone says you need on Etsy to be successful. And if you have your own online shop or sell on Shopify or Facebook, then you probably are aiming for a similar number so your site looks robust and full of choices for your customers. Those 100 products don't have to take you months to create. Using Photoshop mockups like these gives you so much more opportunity to sell because of just one quick export like I showed you in the image above. "I am able to do pretty much everything I need to create the virtual items I have in my site. Almost 90% of the images in my site, were created in Photoshop and I was able to create them because I took the course. Still go back and re do lessons when I forget how to do a certain activity." These ladies are just like you! Handmade business owners, trying to find time in the margins to bring additional income for their families. They found out that they didn’t need to be techy, spend hundreds of dollars, or be professional designers to add this skill to their business toolbox. By taking a little time to focus on learning these - not that hard - skills, they’ve gotten the ability to make UNLIMITED mockups. What do you think, are you ready to give Photoshop mockups a try? Join us in the free FB Group! This is an updated version of my previous article, How Do I Resize My Mockup for Etsy, which featured one of my mockup files. So if you want to see those older instructions you can pop over there, but this new method is much improved! Size matters when you’re creating images for your shop. So when you are creating your Etsy shop images you want to be sure your image fits into the view just right - goldilocks style ;-). And it couldn’t be easier inside Photoshop! So today I’ll show you how to size your images for Etsy using the Photoshop Ratio tool. Watch the video to see how. Say you sell glassware for weddings. Most of your images will probably be tall. If you try to upload a tall image to Etsy, it's going to make you crop it. When it is cropped like this, your customers will still be able to zoom in and see the whole picture, but when they are surfing through Etsy, they are only going to see a cropped view. Not only could you lose valuable information or details that are on your image, but this will also deter many of your potential customers if they aren’t see all your most important image goodies, right there in that thumbnail view. No bueno! So, how do you crop your Etsy image to the right size? 1) Use the Crop tool to get the correct ratio for Etsy. Once you have opened your image in Photoshop, click on the Crop tool, which is the fifth tool down the toolbar (all the way to the left). If you like keyboard shortcuts, it is “C”. Find the dropdown option that says “Original Ratio”. You will see several different options. Etsy’s image size is 5 : 4. Since that isn’t an option, choose 4 : 5. Your image will automatically be cropped to four across by five tall. Now you will want to flip that. Next to the dropdown menu that you just used, look for the double arrows in between the four and five. Just click those arrows, and it will switch to five wide by four tall. Now that you can see the Etsy size, drag the photo around using your mouse or the keyboard arrows until you get it exactly where you want it. You want to make sure that your product is showing completely in that window. 2) Make sure that the important information or details are not cut out. Grab your text and drag it into the window where people will be able to see it. You may need to adjust the size or transform it (Command + T to transform) so that it fits better. Once you have it set up the way that you want it, you can go back to the Ratio tool. Because you've used the Ratio tool already, it will automatically return to your previous settings. Once you have it exactly where you want it, just hit “Return”, and it will finish cropping! NOTE: At the top of the window, you will notice an option that says “Delete Cropped Pixels”. It should be left unchecked. That allows you to go back and adjust this crop again. If you check “Delete Cropped Pixels”, those pixels will be deleted and you can never get your original image back. So make sure that you leave that option unchecked! BONUS NOTE: If you have the history pallete open (found under Window > History), you can undo any actions that you have taken. 3) Set your image size to fit Etsy’s requirements. To see your image size, at the bottom of the screen, you will see some text that says “Doc:…” That will show you the width and the height of your image. The minimum size for Etsy is 1500 pixels wide by any height. The maximum is 3000 pixels wide. If you need to resize your image, go up to Image > Image Size, then change the width of your image to fit into that range of 1500-3000. The height doesn’t matter since you will be using the Ratio tool. (When resizing, make sure that you don’t make your image bigger - it will become blurry.) Set your screen resolution to 72. Once you’ve done that, click “OK”. Click on the Crop tool, and again, move your image into the window the way that you like it, hit Return, and save your image. So there you go! I hope you can see how easy it is to size things perfectly for Etsy using the Ratio tool! 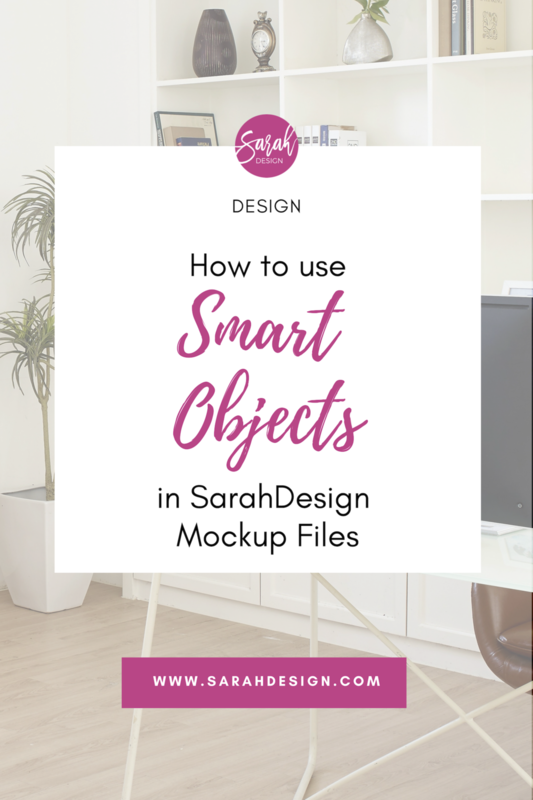 When my students who use Silhouette or Cricut machines want to start making mockups, the first hurdle they have to overcome is how to get their designs OUT of their cutting software and INTO the Photoshop software ($9.99/mo here!) It sounds really hard because your export options are very limited in those programs. But there is a workaround and it’s not hard at all. I can’t wait to show you how! One of my preferred ways of doing this involves using Adobe Illustrator as a middle step, to trace your artwork (and some folks design their cut files in Illustrator so would already be in there). If that’s you, head to this video first. But if you don’t have Illustrator, then keep on reading (and watch the videos below) to learn the next steps! Note to Cricut users: this video demo is in Silhouette but still applies to you! Your interface looks different, but you need to do the same basic process of taking a screenshot of your design (on a white background) and following the steps in Photoshop. So keep on reading! The next step is to take a screenshot. For Mac users, press command+shift+4, and it will take a little picture and save it to your desktop as a png file. For Windows users, you can use the Snipping Tool. Next, open up the file that you just saved to your desktop file. To do, this, click File > Open > Desktop > select the screenshot > Open. At this point, we get to use a handy tool in Photoshop called Color Range. To do this, click Select > Color Range. This will give you a little eyedropper. With the eyedropper, click on the black letters. Make sure that “Selection” is chosen at the bottom, and hit okay. Now it has selected the word “Welcome”. To put this selection on a new layer, click Edit > Copy, and then Edit > Paste. If you want, you can turn off the old layer to see what the details of that really look like. To do this, add another layer below, and fill it with some bright color, like red. If you really zoom in, it's pretty bumpy around the edges, but it is absolutely good enough for our purposes! Next, we need to make a smart object for the wood sign area. This will allow us to add new designs quickly and easily to this wood sign mockup in future. So far, you have taken your image out of Silhouette and brought it into Photoshop. You have selected your design, and now it should be on its own layer, ready to go and to be put into the scene. The next step in this process is to make a smart object that is at the correct angle. You can do this by dragging the layer down onto the little button that looks like a piece of paper. Turn off your background layer. Keep this handy in case you make a mistake on this new layer. Believe me, I've been there. This can be a little time consuming, so take your time and be patient. Use your eyedropper tool to sample the color from the background, and then use your brush. Find a nice soft brush for this, and paint right over top. If you need to change the size of the brush, you can expand or scale down the size. A great keyboard command is to use the brackets on your keyboard. The left bracket makes it smaller, while the right bracket makes it bigger. Now that you have most of the painting done, it might look a little fake around the edges. To fix this, click on the bandaid icon on the left, and use the Healing Brush tool. Anytime you paint between two areas where there is a hard edge of color, you will want to blend the two colors together. Hold down “Option” to sample an area that you are copying over. For example, in the wood sign that I created, I needed the painted section to be a little bit more blue, so I sampled from the blue area. When I needed the unpainted section to be a little bit more taupe, then I sampled from the taupe area. You will need to sample back and forth until it blends the edges. To do this, make a new layer and using the Marquee tool, try to approximate the dimensions of what your shape would be if it were standing straight up, facing the camera. Click Edit > Fill, then choose your color. Deselect your new object. Right click on the words “Layer 1”, and click “Convert to Smart Object”. To make things easier for the future, rename this layer “Smart Object”. Now that this is a smart object, you will be able to stretch it all out of proportion and do crazy things to it, and it won't hurt anything. Select your Arrow tool. Turn down the opacity so that you can better see what you are doing. Next, you will transform (command+t) your smart object to match the angle that you need. Drag each corner to where you need them, trying to match the angle perfectly. Open up the smart object by clicking on the small icon beside the words “Smart Object”. This should open up a new .PSB tab. Find and go to the tab with your design. Be sure that you are on the correct layer, and all of the other layers are turned off, and then select all (command+a). Next, copy (command+c) the design, and go back over to your .PSD file. Paste (command+v) your design into the smart object. Turn off the background color, and save the file. You should now be able to see your design in your scene! If you notice that the position needs to be adjusted, just click on the .PSB tab, readjust the design, and save the file again. You may do this as much as you need to do it, but always remember to save the changes, so that it reflects them on your image. You could probably be finished right now if you wanted to, or you could take the extra step and make it look more natural, like somebody has rubbed over it with some sandpaper. So that's what I will show you in the next video. So far in our process, you have put your design into Photoshop and created a smart object so that you can easily paste it right into your scene. Because it is a smart object, it should be at the perfect angle and it should look pretty good as a whole. However, to make it look more realistic, you will need to add some texture to it. One way to do this is by pasting a texture file over top and using some functions in the layers palette to make it fit right in. Open the texture file in Photoshop. When it opens, click Select > All, and then Edit > Copy. Then close it. You won’t need it anymore. Go back to your scene layer, and click Edit > Paste. It should be right over top of your image. Drag it so that it covers your design. If you are having a hard time seeing through the texture to know if it is covering all of your design, you can turn down the opacity until you get it positioned correctly.- then make sure to turn it back to 100. In your Layers Window, click the drop down arrow next to “Normal”. It will give you a menu of several choices. Click “Screen”. The texture should now be white, but still in the original shape. To mask this, hover your mouse between the smart object layer and the new layer with your texture. Hold down option, and you should get an icon that looks like a little arrow and a box. Once you click on it, it will mask it inside of the smart object. Now it should no longer have the original file shape. By changing the opacity on the smart object layer, you can make the texture darker or a lighter to make it look more natural. You could even color this at this point if you would like. To do this, click Effects > Color Overlay. Choose your color. NOTE: You'll notice that when you used the effects layer to add a color, your texture will not be visible anymore, so there's another way that you can make it visible again. You will need to unmask it by holding option and clicking in between the two layers again. Then go down to the smart object layer, hold down command, and click on the thumbnail. This will select your design only. Go back to your texture layer. Go down to the pallet area, and click “Add Layer Mask”, which is the icon that looks like a little rectangle with a circle in it. This will make a little mask area that only shows up on design. Not too shabby. It's pretty easy to add that texture in and it looks a lot more natural. I hope this was helpful to you and, as always, remember that you can contact me anytime with any ideas that you have for other tutorials or videos. What kinds of things would you like to be taught? What kind of imagery would you find invaluable for your Silhouette shop so that you can really stand out from the crowd? Scroll down for the video if you prefer to learn by watching! The first step in taking great photos of your drinkware at home is to find a place with great lighting. Once you find a good spot, you will need to find the best angle. There should not be too much going on behind your piece of drinkware, because that can be distracting and seem too busy. You should have a clean background. One tip to find the ideal setup for your drinkware is to look through the lens of your camera or phone to see how it will look in the photo. Once you find a good setup, you can easily turn your photo into a mockup, or it could just be a straight up shot of something that has already been etched or that has vinyl on it. These photos will be perfect images for your shop or for quick social media posts! Did you know you can essentially create your very own custom filters right inside Adobe Photoshop? This is a great tool even if you aren’t using mockups. If your product lends itself to natural photos, a quick way to make them beautiful and keep a cohesive look and feel across your brand is with filters or image overlays and effects. You can save these in your layers palette to be shared with other Photoshop files (like I did in this video) or apply them with Photoshop Actions. I created a custom mockup for a student recently, and used some overlay techniques to create dreamy and bright effects on the picture. That created the moody scene, then I just had to add my pre-made glitter-dipped mug mockup on top (with some custom shadow magic added ;-) and voila! She now has a beautiful, editable, mockup template that she can use again and again in her shop images. Since these “filter” effects are saved in their own layers with their own “blending modes”, it will be easy to apply them to subsequent images. All she has to do is put new photos on a layer below or drag the special filter layers into another Photoshop file. In this shot you can see how I used an image of a light flare (found on Pexels for free!) as an overlay on top of the mockup photo. And here I created a lighting effect with white circles then added a hard mix blending mode, and an additional radial gradient layer as an overlay to brighten it overall. I love how it turned out! You can use “actions” to do this. Photoshop Filter Actions are kind of like Instagram filters, turned up to 11. You can create Photoshop Actions yourself, essentially by “recording” your edits on a picture, and then “playing” your edits for each subsequent picture, saving time and headaches. Use caution and only download actions from trustworthy sources. I haven't tested these, but this is a good reference point to start from! Not to worry, you can get it on a free trial, and then when you discover you love it (you will!) it's only $9.99 a month on this plan. That's my affiliate link, but I wouldn't recommend Photoshop if I didn't believe in it and how powerful it can be even for beginners. You only need to do basic things to fully enjoy this program and use it for your business. I've been using and recommending Photoshop for 20+ years and only became an affiliate in early 2018! Think you're going to try some Photoshop Actions? Maybe by recording your own or purchasing some? Be sure to join my Mockups for Drinkware Makers Facebook Group so you can tell me all about it! This post may contain affiliate link(s) which, at no extra cost to you, may make me a small commission when you click through and make a purchase. You can learn more about how I use affiliates here. Thank you for supporting my business! Making a realistic shadow in a product mockup requires more than just using the drop shadow effect in the Photoshop layers palette. It actually requires a little observation about how shadows look in real life, and a few layers with some deftly applied blurring to really look convincing. It is SO frustrating when you spend time and effort on creating your beautiful and unique vinyl and etching design, and then see someone blatantly stealing it and selling it. I often wondered what you can really do when this happens. Thankfully, Joey Vitale over at Indie Creative Law knows all about this and graciously wrote the guest post below to help us out.